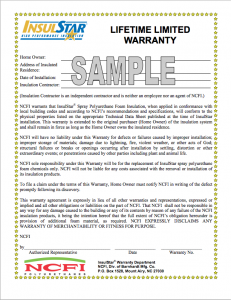 NCFI warrants that InsulStar® Spray Polyurethane Foam Insulation, when applied in conformance with local building codes and according to NCFI’s recommendations and specifications, will conform to the physical properties listed on the appropriate Technical Data Sheet published at the time of InsulStar installation. This warranty is extended to the original purchaser (Home Owner) of the insulation system and shall remain in force as long as the Home Owner owns the insulated residence. 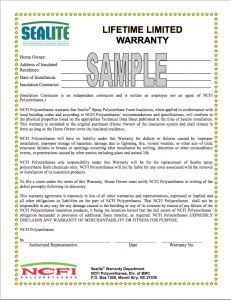 NCFI Polyurethanes warrants that Sealite® Spray Polyurethane Foam Insulation, when applied in conformance with local building codes and according to NCFI Polyurethanes’ recommendations and specifications, will conform to the physical properties listed on the appropriate Technical Data Sheet published at the time of Sealite installation. This warranty is extended to the original purchaser (Home Owner) of the insulation system and shall remain in force as long as the Home Owner owns the insulated residence.